River Bridge Kwai at Kanchanaburu, Thailand. I took this photo of the rebuilt bridge. The original bridge was bombed by USA B-24's. The movie - River Bridge Kwai - shows the building of one large bridge. In fact the Allied POW's were forced by viscious Jap soldiers to build many bridges leading to Burma. We took a bus from Bangkok to here and then boarded an old open window train and traveled along the Kwai River for many miles, departed, crossed the river on a small boat, drove to a village and boarded another larger boat traveling up and down the river. Near the large bridge is an open thatched "JEATH" museum and a cemetery where hundreds of the POW's are buried. The name of the museum is gathered from the first initial of the Allied Countries POW's, E for England, etc. 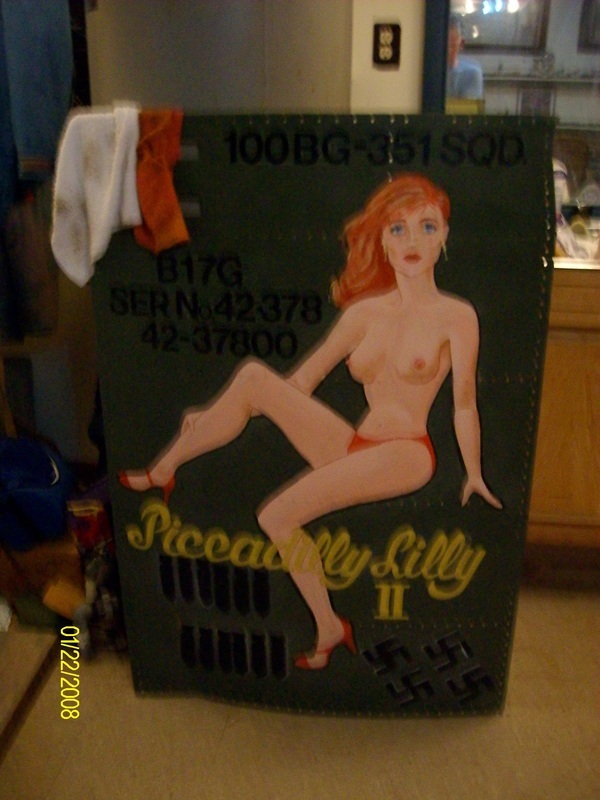 This is a photo of one of my collection of Nose Art, which was the common practice during WW II for the pilot and crew to name and display a drawing of their choice. There was also a Picadilly I. Of course they reference Picadilly Circle in London where service men made hopefully connections to young ladies for an evening of fun. Dr. Van and Louie Zamperini. Louie is the subject of the number one best seller book, "Unbroken", in all of 2011. Laura Hillenbrand worked six years writing this book. I have Louie profiled in my "Famous Faces of WW II" and we have been friends for twenty three years. This photo was taken in August, 2011. He was 94 years old and still ticking. But sadly he died at age 97 in July, 2014. The movie of "Unbroken" was released in December, 2014. Go see it. The book, 'Unbroken" is the most captivating read I have ever experienced. The content powerfully grabs the reader. It carries his life from child to the present day. Louie suffered 47 days on a life raft in the Pacific and floated onto a Jap held island. He was captured and spent about 3 years in a Jap Prisoner or war camp in Japan. It is an unbelievable story. Read it. He lives in his old home in Torrance, California. The Torrance airport is named after Louie. This photo was taken 7 June, 2010. (date on photo is wrong) I'm the guy in the blue stripes. This group of jumpers are all volunteers who go to WWII events and demonstrate jumps from an old WWII C-47. We had three ladies jump on this day at St. Mere Iglis, Normandy, France. The young lady standing left behind me is an attorney from Washington D.C. Near the tree row in back are about 15 thousand French spectators. They absolutely adolize the Americans who freed their land from 4 years of Nazi occupation. Photo taken at lunch with General Thom Stafford, Apollo Astronaut. I volunteer at the Stafford Air/Space Museum in Weatherford, Oklahoma, his home town. After graduation from the Naval Academy he became and Air Force Pilot and then to NASA. It is amazing to sit at lunch and visit with a man who has circled the moon. A humble and generous man who takes us to lunch and evening dinner. The photo date is wrong. 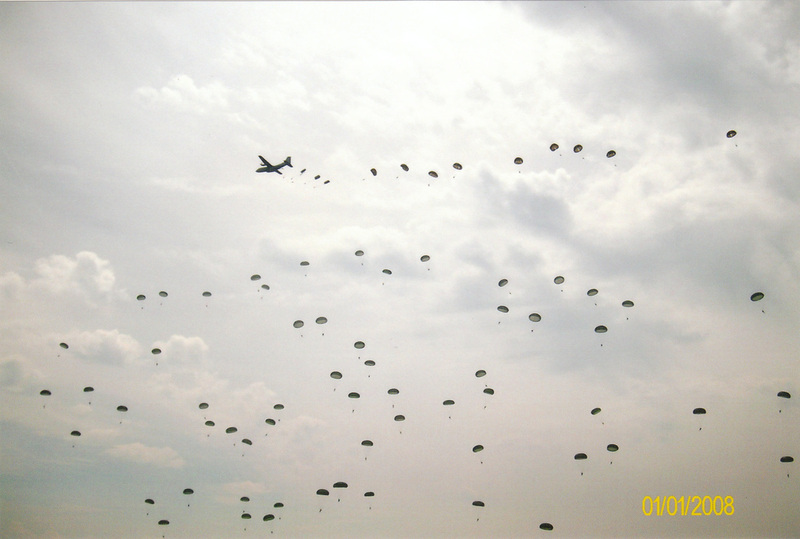 I took this picture on 6 June, 2010 after the jump at St. Mere Eglis. The man, sorry, lost his name, is 96 years old and jumped at this site on D-Day 6 June, 1944. This young lady and man both jumped on this day from a US Military plane. I took this photo in a Museum near Malmady, Belgium where the Nazis executed over a hundred American Soldiers. The short guy is Mickey Rooney on a USO Tour. He also served in the Army.